Each font comes with full character sets and represents exceptional value at only $99. But that’s not all – for the next few days, you can order this pack from MASTERBUNDLE and save over 80%. 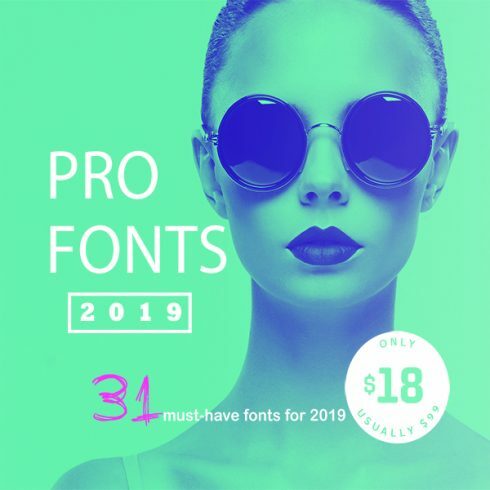 That’s right for just $18 you’ll get over professional 30 fonts (57 including the extended families)! 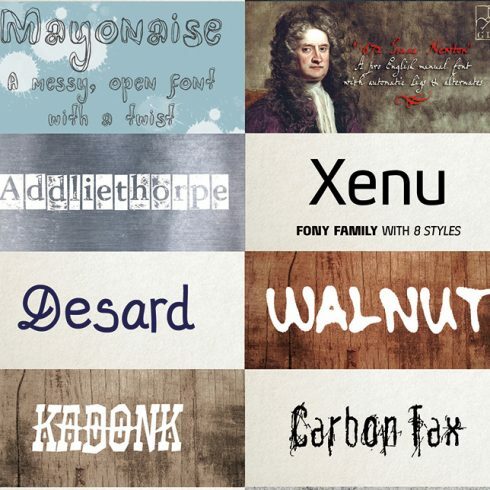 • This MasterBundle collection includes a whopping 31 different fonts! That’s a tremendous amount of professional, high-quality typefaces, sure to keep you satisfied on your next project, no matter what message you’re trying to convey. No matter what your font’s intended purpose, this collection has you covered. Besides featuring a gorgeous collection of exciting display fonts, you’ll also get a wide range of crisp-printing text fonts. Different fonts give off different emotions. That’s why some typefaces are more suited than others for a particular project. With this font collection, you’ll get a bevy of styles including distressed, calligraphic, hand-drawn, grunge, decorative, space-age, script, and more! Your purchase of this Masterbundle gets you all these super-usable fonts in versatile OpenType format. They’ll work beautifully on both Macs and PCs too! Thanks to the OpenType format, you’ll get a ton of extra features with your fonts. Look for kerning pairs, interlocks, full character sets, international currency and glyphs, and so much more! A web font is a variety of symbols of a particular dimension and pattern that shapes one thematic and structural system. The key purpose of any font is to attract the user’s interest with its outline and shade and get him to read the written content. A high-quality web font enables you to present not merely the text content but also a particular feeling. Cool and unconventional web fonts are more powerful and more evident, so every company attempts to regularly use its unique one as an essential part of their brand identity. The cost of custom web fonts typically varies from zero to over 100 dollars. There are 5 types of fonts. Serifs are more typical, you can tell them by small lines attached to letters. Sans-Serifs are a modern font type, and letters will not have tiny “feet” . Slab-serifs look chunky and blocky, these fonts add substance to the design and style. Script fonts resemble handwriting and also have connected letters. Stencil fonts have curved boundaries and narrow strokes, you might use them to develop a creative headline. What Are Bundles and How Much Money Do They Cost? A font bundle is basically a group of various two to fifteen fonts available at more affordable cost. The best part of getting sets is that they cost you a little bit more than one font does, as long as they are on sale. The regular value of a font set on our website is only $2-20. However, be quick: the life period of each bundle lasts less than 5 days. Can Fonts Have An Effect On The Perception of the Product? The quality of typography can determine the way in which customers comprehend and understand content. Fonts help to capture attention and establish structure. Fonts determine the atmosphere and develop business attractiveness. Marketing experts know that fonts can make or destroy virtually any graphic advert, business logo, or brand graphics. When the designer uses sloppy or plain looking fonts, visitors perceive the style and design as cheap and don’t respond. If the typography is unreadable, your entire artistic project does not work out to reach its aims. No worries then! MasterBundles offers lots of different bundle options for different occasions and styles. Just check out our website and you’ll surely find something to your taste and requirements. What Other Sorts of Bundle Deals Do You Supply on MasterBundles.com? Besides web font packages, we have lots of helpful design & production packages to offer. Those can have an incredible impact on your work efficiency if you are a UX/UI designer or artist. Those are pre-made kits with premium infographic elements, patterns, WP web templates, and in general, web sets with multiple items together. All of those sets are very affordable throughout the sales period, so it’s better if you keep track of those opportunities before it’s too late! MasterBundles.com is an online marketplace. On our resource, pro designers offer their masterpieces at the best prices. We provide you with the very best design bundles out there, and our bundles are well reviewed by clients. Go and visit our blog, it is loaded with practical and motivating information for pro web designers. Also, in case you register for our newsletter, you will be the first to find out about our special discounts. There are always discount codes and promotional codes available to lower the price to a bare minimum.